That page has even more performance details. Year introduction is 2002 (model year) for the 405hp facelift, actually. Look down through GM High-Tech Performance. @ Ricktrr: You're right, it is 405 horsepower. Top speed is 177 mph. The 2003 Corvette Z06 is rated at 405hp, not 380. That's 385 horsepower, a top speed of 171 MPH, and 1 mile drag is 33.3 seconds @ 155 MPH. This page has errors, and should be deleted. The 2001 Corvette Z06 page is far more accurate, and was made to replace this one. Probably not, considering the many other car pages that haven't been deleted like the Camaro Z/28, Vantage RS, etc. Will this page get deleted? No, I said it was 4.8 of it didn't used roll out, C&D did 4.5 with roll out... I don't really remember who was driving though. I agree Viking, 4.8-5.0 to 100km/h would be a good time. I was just point out that the 5.2, albeit slow, it's not really that far off. Yeah, 5.2 seems a bit slow. The C5 Vettes hook up very well. I would expect roughly 5.0 for a 0-100 kph w/out roll out. In any case the page should be eliminated, since we already have a page with the correct info. Ive tested 4.54 0-60 on my own C5Z(01'), and I'm no racing driver. I don't know it just seems way to slow, even 4.8 with roll out, who was driving it for C/D?? Yeah this car has completely wrong specs for its model year, and wtf 0-100 5.2?? Can we delete this page? The other one has the correct model year, power figure and more data. 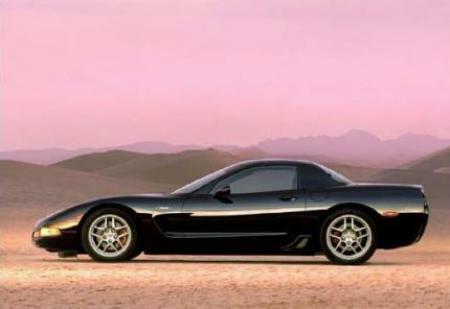 The 03 model year Z06 had numerous driver assist enhancements. This is probably being applied here. OH I SEE NOW SOMEONE THINKS THE 2003 HAS 380 HP. LOTS OF MISTAKES HERE. THERE NEEDS TO BE DIFFERENT CATIGORIES FOR THE 01 AND THE OTHER C5 CORVETTES. @ BumRush, you are right about the 0-100 time. Also, 01Z06guy is absolutely right regarding the model year of this Z06 and the "02-04" Z06. Anyhow, this cars introduction year is 2001. Yet again 0-60mph isnt 0-100kmh, its 0-62mph. 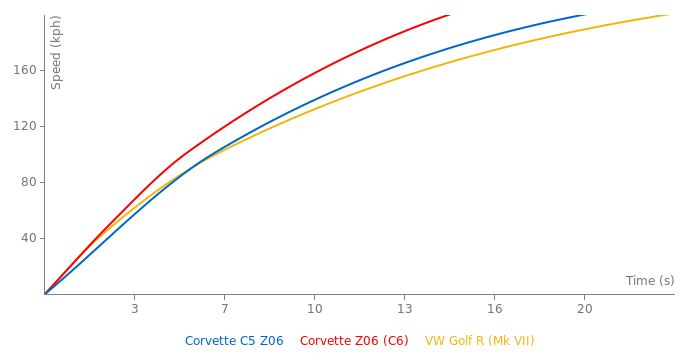 but your right, the C5 ZO6 with 405bhp does 0-60mph in 3.9, but this one with 385bhp does it in 4.2, so 0-100kmh will be round 4.5, thats why there should be both metric an imperial datas displayed. OK SERIOUSLY THE INFO ON THE ZO6 NEEDS TO BE FIXED! ALL THE RIVAL RESULTS ARE WRONG BECAUSE OF THE FACT THAT SOMEONE THINKS THIS CAR HAS A 0 TO 60 TIME OF 5.2 SECONDS. THE CAR IS RATED IN THE 2002 MODEL TO DO 0-60 IN 3.9 SECONDS. GRANTED THAT MAY BE ALITTLE OPTIMISTIC BUT I DOUBT THAT IT IS ANY SLOWER THAN 4.2 WITH A DECENT DRIVER. PLEASE FIX! The years for the C5Z06's are all screwed up. Reality is the 2001 C5Z06 was 385hp and the 2002-2004 C5Z06 was 405hp. But somehow you have one listed as a 2003 with 380hp and the other called a '02-'04 called a 2001. ???? I know the n'ring time was done with a 2004 model, but were the rest of these times from a 2001? I doubt it. Truthfully, there is soo little performance difference between the years that they should be combined and just called C5Z06. Sadly, there are soo few times for this extremely strong and popular track car that splitting them into two different cars over an unnoticeable 20hp is counterproductive. But if they must be split up, at least get the years corrected.